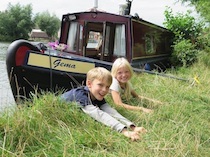 The MRC-Gema class canal boats. 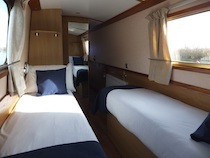 Gema is a luxury narrow boat with a modern and fresh feel, whilst still retaining the quaint charm of an English canal boat. The seating on the front deck allows you to eat outside and enjoy the stunning scenery while on your boating holiday on River Thames. Wifi on board. A sim card can be purchased at booking for Â£20.00 giving 2gb of data. This can be taken home with you afterwards. The spacious and light feel of the saloon area is perfect for entertaining. 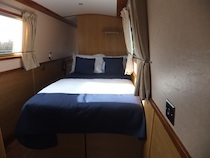 The dinette converts to a further double bed, providing an additional 2 berths and Gema can accommodate up to 8 people comfortably. 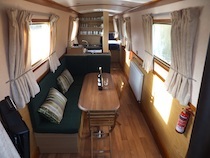 Gema has a solid fuel stove in the saloon for warm and cosy evenings onboard.Flat screen TV/DVD player, Ipod radio with built in phone charger (Iphone 4 connection). The bathroom offers a flush toilet, wash basin and shower, plus extra toilet and wash basin. A welcome pack is provided, consisting of washing-up liquid (x1); dishcloth (x1); ; floor cloth (x1); toilet roll and bin liner.